Looking back in history: Mao Zedong on the assassination of Martin Luther King | Fight Back! 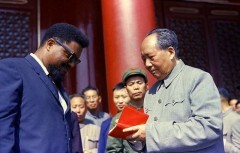 Mao Zedong with U.S. revolutionary Robert Williams. Fight Back News Service is circulating the following April 16, 1968 statement from Mao Zedong on the assassination of Martin Luther King. Some days ago, Martin Luther King, the Afro-American clergyman, was suddenly assassinated by the U.S. imperialists. Martin Luther King was an exponent of nonviolence. Nevertheless, the U.S. imperialists did not on that account show any tolerance toward him, but used counter-revolutionary violence and killed him in cold blood. This has taught the broad masses of the Black people in the United States a profound lesson. It has touched off a new storm in their struggle against violent repression sweeping well over a hundred cities in the United States, a storm such as has never taken place before in the history of that country. It shows that an extremely powerful revolutionary force is latent in the more than twenty million Black Americans. The storm of Afro-American struggle taking place within the United States is a striking manifestation of the comprehensive political and economic crisis now gripping U.S. imperialism. It is dealing a telling blow to U.S. imperialism, which is beset with difficulties at home and abroad. Racial discrimination in the United States is a product of the colonialist and imperialist system. The contradiction between the Black masses in the United States and the U.S. ruling circles is a class contradiction. Only by overthrowing the reactionary rule of the U.S. monopoly capitalist class and destroying the colonialist and imperialist system can the Black people in the United States win complete emancipation. The Black masses and the masses of white working people in the United States have common interests and common objectives to struggle for. Therefore, the Afro-American struggle is winning sympathy and support from increasing numbers of white working people and progessives in the United States. The struggle of the Black people in the United States is bound to merge with the American workers’ movement, and this will eventually end the criminal rule of the U.S. monopoly capitalist class. In 1963, in the “Statement Supporting the Afro-Americans in Their Just Struggle Against Racial Discrimination by U.S. Imperialism,” I said that the “the evil system of colonialism and imperialism arose and throve with the enslavement of Negroes and the trade in Negroes, and it will surely come to its end with the complete emancipation of the Black people.” I still maintain this view. At present, the world revolution has entered a great new era. The struggle of the Black people in the United States for emancipation is a component part of the general struggle of al the people of the world against U.S. imperialism, a component part of the contemporary world revolution. I call on the workers, peasants, and revolutionary intellectuals of all countries and all who are willing to fight against U.S. imperialism to take action and extend strong support to the struggle of the Black people in the United States! People of the whole world, unite still more closely and launch a sustained and vigorous offensive against our common enemy, U.S. imperialism, and its accomplices! It can be said with certainty that the complete collapse of colonialism, imperialism, and all systems of exploitation, and the complete emancipation of all the oppressed peoples and nations of the world are not far off.